Badges are numerical indicators of how many items are associated with a link or a normal text. i hope you understand by seeing above image, actually my requirement is in above image is whenever i add employee name with city and if i click on add button that details will store in database table is employee and retrieve that data and display in right side column no of employees in city wise. In this block you can see html code that exactly which i used to design in above images. <asp:Button ID="btn_Add" runat="server" Text=" ADD " CssClass="btn btn-primary"
this block of code is only used to store employee data which means employee name and city will store in database table when you click on add button. And another thing is that we are calling a method i.e "BindNoOfEmployeesInCity()" method. In this method i'm using a sql query actually that query is used to count number of records based on city from employee table. //this if statement i'm using simple condition that whose city names is so on so. 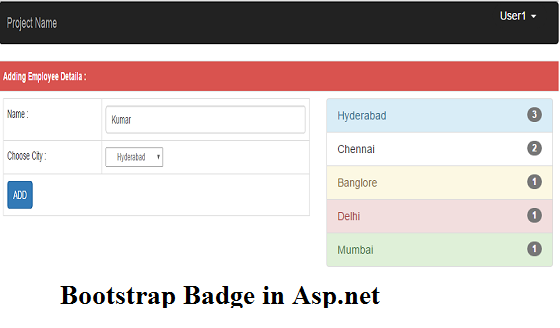 0 Komentar untuk "How to use Bootstrap Badges in Asp.net"